SAP Simple Finance provides huge cost and time saving to manage finance and accounting by leveraging the computing power of SAP HANA. Universal journal combines all the good qualities of accounting components. In the previous SAP Finance Accounting tool, all the components are separately managed due to technical restrictions without HANA platform. With the new architecture of SAP Simple Finance, Universal Journal serves as a single source for all components with one line item table. Multidimensional reporting on Universal journal without performing data replication to BI. Universal Journal as one-line item table with full detail for all the components. No reconciliation is required and data is stored only once. Improved structural capabilities of the financial solution – multiGAAP, additional currencies, etc. Support for the existing ABAP programs or reports to prior tables with read access. You can easily extend Universal Journal with customer fields. Extensibility is available for all the components that use Universal Journal – G/L, Asset Accounting, and Material Ledger. Extensibility for General Ledger coding block extensibility. 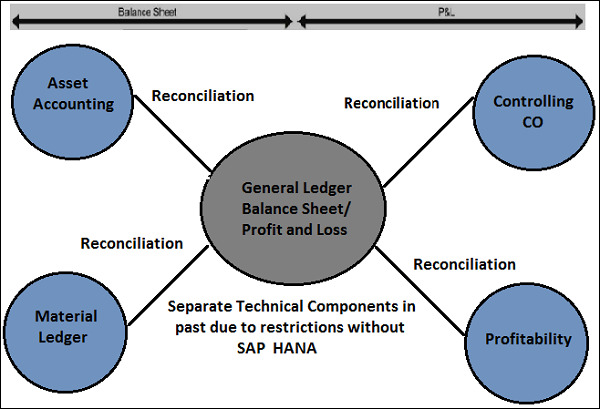 HANA based reporting of all the components – General Ledger, AA, and Controlling.